Good thing cell phones weren’t around, or these movies could have been resolved real quick! We all love this classic. 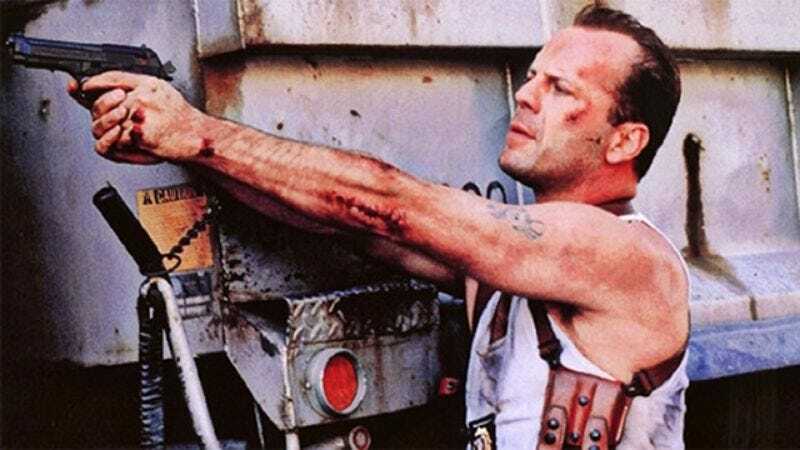 John McClane (Bruce Willis) is trapped in the Nakatomi Plaza skyscraper playing cat-and-mouse games with a gang of murderous thieves. Too bad he didn’t have a cell phone, though, or he could have saved the hostages faster than you can say “Yippee-ki-yay!” All McClane would have needed to do is pull out his smartphone and shove it deep into Hans Gruber’s chest, piercing his rib cage and heart. The criminal mastermind would have immediately lost consciousness and bled to death! Game over. This robotic assassin from the future seemed like an unstoppable force, able to shrug off bullets and explosions with hardly more than a scratch. But if cell phones were around, it would have been no problem for Sarah Connor to lure the Terminator into a warehouse and use a crane to drop a shipping container of Samsung Galaxy Notes onto him, crushing his metal endoskeleton and piercing his chest with hundreds of smartphones. It’s every teen’s worst nightmare: a town that bans dancing. However, the Bomont city council of today would have never even had a chance to make rock and roll illegal if a horse had been startled by the Nokia ringtone and kicked the phone so hard it flew straight through the chests of all the council members, piercing their rib cages and hearts. Roll credits! Eddie Murphy’s breakout movie couldn’t have been set in the age of cell phones. In the film, streetwise Detroit cop Axel Foley heads to Beverly Hills to investigate the murder of his friend. However, his friend would never have died in 2015 because his attackers would have probably tripped on an iPhone charging cable, fallen out the apartment window, and became impaled on the checkmark in the sign of a Verizon wireless store, which would pierce their chests instantly. Technology FTW! We’re lucky that The Goonies came out in 1985 because the story would be pretty unsatisfying today. Instead of the gang searching for pirate treasure in a cave, they could have just made a fortune by getting hired as UX designers at Apple. And the Fratelli crime family wouldn’t be a problem—the second they set foot on Apple’s Cupertino campus, security officers would detain the Fratellis and kill them by stabbing them with phones, instantly piercing their hearts and rib cages! The Goblin King (David Bowie) gave Sarah (Jennifer Connelly) 13 hours to solve the labyrinth and save her brother, but she would have needed about two seconds had she owned a cell phone! All she would have to do is chisel through the maze walls and travel in a straight line to the Goblin King’s castle. Once she arrived there, it would take mere moments for her to shove a cell phone through his chest and pierce his heart. Nice! This classic comedy would likely have a much darker tone if it was made in the smartphone era. When Ferris started twisting and shouting for the crowd at the parade he was leading, he would have accidentally shoved his own iPhone through his neck, severing his spine and decapitating himself. The festival-goers would then likely all follow his example, resulting in thousands of Chicagoans chopping off their heads with their phones, spraying geysers of blood along the entire parade route. Yikes! Talk about a bummer. I think we can agree that some movies are better off just the way they are!